No matter what adventure you find yourself part of, taking a break to eat a warm meal is essential. For campers, backpackers and mountain climbers, cooking equipment can be heavy to carry and difficult to use. 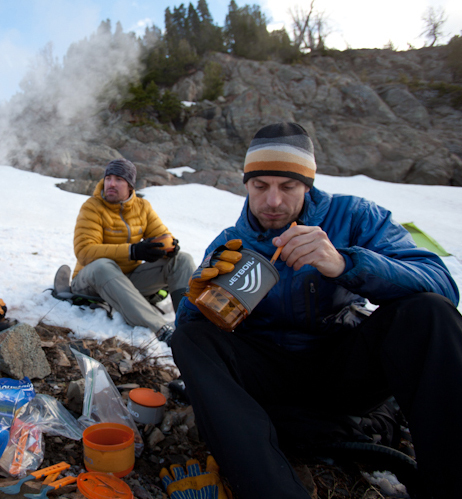 However, with Jetboil Cooking Systems, weight, durability and functionality are of top importance. Using an insulated thermos-style cup to boil water or food, it eliminates the need for an extra pot. The Jetboil comes complete with a number of accessories including a detachable measuring cup, a canister stabilizer and a cozy with a handle. This product is available in a wide array of models suitable for outdoorsmen of all levels. The Flash Cooking System ($99.95) is a great economy option for the casual front-country camper. This model comes complete with a heat indicator, a push-button igniter and a one-liter cup. The Zip Cooking System ($79.95), at 0.8 liters, is a smaller, more personal substitute to the Flash. Instead of a push-button igniter, this version uses a simpler match ignition. The Sol Advanced Cooking System ($149.95) is best for the more seasoned back-country explorer. With Jetboil’s regulator technology, it is equipped to last through extreme weather conditions. This model holds 0.8 liters and, like the Zip, it is the most portable of the collection. The Sumo AL System ($144.95) is a larger model of the Sol, able to hold 1.8 liters. Because of its size, this variant is best used with a small group, and includes three bowls to share. The Joule Cooking System ($199.95) is the crown jewel of the Jetboil family. With a 2.5-liter cup, it can be used to serve up to five people. Designed specifically for extreme cold weather climates, the Joule will work in temperatures as low as 10 degrees. Beyond being a major hub in the global transportation network, Hartsfield-Jackson is also proud to be a major hub for exciting, high-quality retail options through our award-winning concessions program, ATL Skypointe. The city of Avignon is home to a famous bridge immortalized in a French children’s song, but why is it so famous?